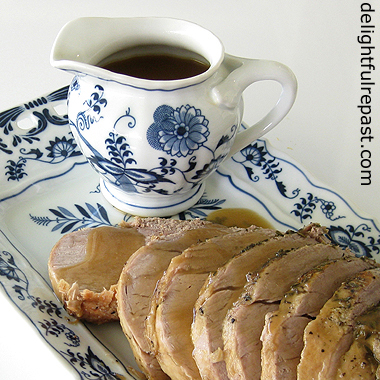 Boneless Pork Loin Roast is so easy and, more important, so good in the slow cooker. Not that I don’t love a fall-apart braised hunk of meat some times, but this isn’t it. This is just like a roast that comes out of the oven. You know, roast it, rest it while you make the gravy, then slice it into tidy slices. And, with summer coming on, I will be so glad to be able to make a roast dinner without having to run the oven and heat up the place! Sometimes I put a good sear on the roast before putting it in the slow cooker, but this time I just wanted to throw it in there and see what happened. Though it perhaps doesn’t look as pretty without that initial sear, it tastes every bit as good. You don’t add a lot of liquid. Just 2 teaspoons of lite soy sauce and 1/3 cup of wine. I usually use red, but this time I used a white that I’d been wanting to open. Set the slow cooker on low and go about your business for 6 hours. The roast will be perfectly tender but make neat slices. Simple gravy. Dinner’s on the table. No muss, no fuss. And I’m cool as a cucumber. Don't forget to Pin it and share it! 2 Place in slow cooker with onion, celery and carrots. 3 Pour wine and then soy sauce over the roast. 4 Sprinkle marjoram, thyme, cayenne and 1/4 teaspoon salt over the roast. 5 Set slow cooker to Low for 6 hours. 7 Strain sauce (there will be about 1 1/4 cups) into 1-quart saucepan. Stir in slurry to thicken the sauce; simmer for 5 minutes. Ah, that perfect balance between moisture content and texture. Looks like you found it! The chew test tells all. My dad liked shoe leather grade roasts. My mom obliged him. I developed the strongest jaws for six blocks around. Bon appetit! Thanks, Sully. No shoe leather for me, but I do like to chew a bit! :-) Pulled pork is all well and good, but it isn't really a roast. Easy peasy...and the loin turned out so tender and flavoursome! Thanks for sharing, Jean. Angie, thanks. Yes, I love cooking it this way. I like a bit of pork Jean. Looks good but that Delft ware, Great stuff. Have you got Dutch ancestry too? Your English ancestry should bring out the ,"Willow Pattern," in you!!!!! The Dutch and the British were trading rivals in the Far East, China, Japan, India, South East Asia and so froth in the letter part of the 18th century. Obviously not ALL the crockery got smashed in their sea battles.Ha! Ha! I'm in the middle of a juice fast at the moment and I'm not going to lie, this has me salivating! Thanks for sharing with #TriumphantTales! This sure looks delicious! I wish my wife liked pork but she doesn't. Sigh. Might still have to make it sometime when she's out of town and I'll freeze part of it for myself. Hi Tony - Those pieces are the blue onion pattern called Blue Danube. I love Blue Willow, too, all the blue and white china patterns! The naval officers mother's must have warned them, No matter what else is going on, save the crockery! Thanks, Jaki! Hope your fast is over before Sunday Lunch! Richard, thank you. And, yes, make one for yourself and freeze individual portions of roast and gravy for those occasions when you're dining solo. Thank you, Martha! If you have a big roast, about 4 pounds, you might as much as double the liquid as long as that doesn't have the roast sitting in a lot of liquid. Do let me know how it turns out for you. I have never tried anything like this in the slow cooker. Thank you for the inspiration and the reassurance that browning isn't strictly necessary! Pauline, thank you! 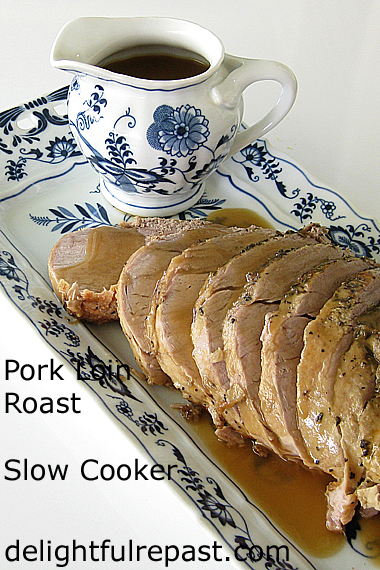 I hope you will enjoy it as much as we do - a real (sliceable) Sunday Roast in the slow cooker. And with gravy! Looks great, Jean. I'm also admiring your pretty blue and white dishes! YUM. I want this NOW. Making this for sure in the near future. Thanks for sharing! That looks delicious! And I like that "cool as a cucumber" part! Thank you, Margie! I love those dishes. Thank you, Elizabeth. And glad to meet you! Thanks, Cheryl! I was just thinking about you today! What an easy and delicious recipe. Of course whenever I serve pork I have to make it with red cabbage and mashed potatoes. Thank you, Gerlinde. But of course, on those sides! Years ago I was taking a meal to a German neighbor who was ill, and I researched German recipes. Can't remember what else I made, but one thing was rotkohl mit apfel. She was so pleased. Now this is my sort of meal. We didn't eat pork of any kind growing up so I like seeing these kinds of recipes that make it look easy to do pork right. Beautiful photos! It looks delicious,Jean!Thanks for sharing,hugs! Thank you, Jan. I love anything with mashed potatoes and gravy! Ellen thank you. And I think you've said something I should have included in the post--this makes it easy to do pork right! Thank you, and hugs, Maristella! Looks so good I'm going to have to go buy a pork roast this weekend! Thank you, Sugar. Enjoy! So sorry to hear about your MIL. What a great idea to braise this in a slow cooker. So often they are dry, and this recipe probably makes them very moist! Thanks, David. I like that the roast comes out moist and tender, but NOT falling apart. Sliceable rather than shreddable. This sounds like the perfect roast to fix for our hot Texas summertime, Jean! Thanks for sharing! For some bizarre reason I seem to use my slow cooker in the winter and ignore it in the summer. I now see the error of my ways. I'm going in to the cupboard and dragging it out for some fine pork cooking. (Assuming that I can find it, of course). Phil, you are not alone! But I caught onto to the idea of the slow cooker being a summer appliance long years ago because I have never been a fan of warm weather. Anything to keep me cool! Whenever I click over to DR, it always reminds me to take meat out of the freezer, so thank you. We raise, butcher, & relish our own pork, so reading today prompted me to take out a roast for the slow cooker tomorrow - I know it's going to be a 'delightful repast". Aaaw, Mrs Shoes, thank you so much. You just made my day! Thank you, Amalia. Mr Delightful says he wouldn't mind having it every week! This looks delicious. I enjoy roast pork as long as it's moist and this looks like it will be. Pinning so I can give it a try! Hi Jean ! 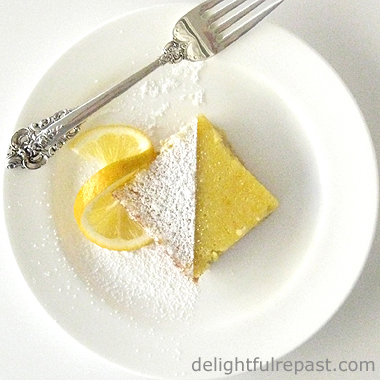 I'm loving this recipe, thanks for sharing it with us. I will soon try it with Mr. Living, he loves pork ! I have a Hutschenreuther china with the same platter; I love the Onion pattern. Thank you, Donna. Do let me know how it turns out for you! Fabby, thanks! I hope Mr Living likes it as much as Mr Delightful does! I just have a couple of Hutschenreuther pieces, including a white teapot--love it! I really like this recipe, Jean! While I like fall apart meat, I don't like it all the time, and the idea of a slow cooker roast that is more like a traditional roast really appeals. I also like the flavours you have used in the recipe and how easy it is. Sharing on Twitter and on the Hearth and Soul Facebook page. Thank you for sharing and for being a part of the Hearth and Soul Link Party. Just a reminder that H&S is taking a break this week as I'm travelling, but we'll be back next week on Monday June 25th, all set to celebrate the party's 8th birthday! Hope to see you there. Have a lovely week! April, thank you so much. Enjoy your travels! And do let me know how the roast turns out for you. Love H&S, and thanks for the reminder. Thanks, Kristina. There's just something about blue and white china! Oh this looks so delicious without heating up the oven! Thank you for sharing! Pam, thank you! I hope you'll give it a try one of these hot summer days. Pork roast is so good, isn't it? I've never made it in the slow cooker -- never even thought to do so! -- but I'm loving this recipe. Really good stuff -- thanks. Thank you, John! I hope you'll give it a try this summer. What are the chances I can get a "How To" for making gravy? I am seriously terrible at gravy, the last time I actually tried it, it had to be chiseled out of the pan! Heading to the grocery store now for a Pork Loin Roast... Hoping to have choices for an upcoming surgery where I only have to microwave! Cheryl, the gravy for this is super simple. You'll be thrilled! When you take that lovely boneless pork loin out of the slow cooker, you'll just pour the liquid that's in the slow cooker into a saucepan. Then shake together the flour and water to a smooth slurry and stir it into the liquid in the saucepan. Cook and stir until it thickens. And there you have it! Shouldn't have any lumps or any problems at all. Do let me know how it turns out for you. Kathryn, thank you so much! I'll check that out. I love #MakeItPrettyMonday!